According to Border Patrol sources, violent MS-13 gang members are using the Nogales processing center in Arizona as a recruitment hub and as a transfer point for gang members to get into the United States. The Red Cross has set up phone banks inside the processing center so unaccompanied minors can make phone calls to family members inside the United States and back home in Central America. According to sources, those phones are also being used by MS-13 members to communicate with gang members already in the United States and operating in cities like Atlanta, New York and Chicago. Further, many teenaged males inside the facility have approached Border Patrol agents and have said gang members have tried to recruit them from shared cells. 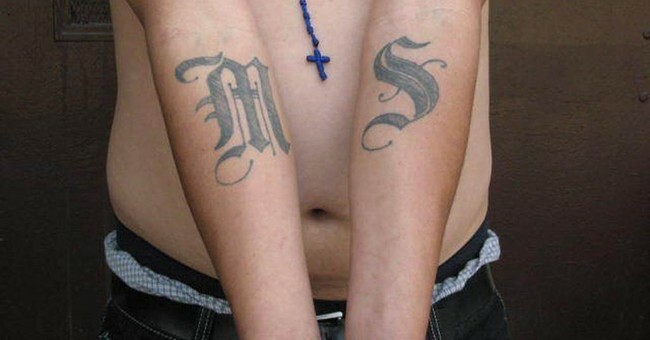 According to the FBI, MS-13 regularly targets middle and high school students for recruitment. "The National Border Patrol Council believes there to be serious security issues at the Nogales Processing Center. Agents' hands are tied due to the policies governing the care and lodging of juveniles and this has allowed gang recruitment and activity to flourish amongst those being detained," vice president of the National Border Patrol Council Shawn Moran tells Townhall. "Customs and Border Protection needs to do more to ensure that gang members that are in custody at the NPC are identified, prosecuted, and prohibited from benefiting from this crisis." Earlier this week an internal Border Patrol summary confirmed at least 16 MS-13 gang members from El Salvador, Honduras and Guatemala are being housed in the processing center after graffiti was found on bathroom walls. These same gang members admitted to acts of torture and murder in their home countries before heading north to the United States. "Border Patrol Agents (BPAs) and Customs and Border Protection Officers (CBPOs), assigned to The Nogales Placement Center (NPC), discovered that 16 unaccompanied alien children (13 El Salvadoran males, two Guatelmalan males and one Honduran male) currently being held at the NPC are members of Mara Salvatrucha (MS-13). The MS-13 gang members admitted to their gang associations following a discovery of graffiti at the NPC. Homeland Security Investigations (HSI), ICE Enforcement and Removal Operations (ERO), and the Office of Refugee Resettlement (ORR) were notified," the summary states. "Homeland Security Investigations (HSI), ICE Enforcement and Removal Operations (ERO), and the Office of Refugee Resettlement (ORR) were notified." MS-13 members are required to be processed by Border Patrol and then are handed over to Immigration and Customs Enforcement, where they are often times placed inside the U.S. and given a court date. They rarely show up. By U.S. legal standards many gang members operating in Central American countries and traveling north are classified as minors due to being under the age of 18. However, many young males are actively engaged in violent cartel and criminal activity, yet are treated as children when processed through the Department of Health and Human Services or Department of Homeland Security systems. RELATED: Don't forget to order Katie Pavlich's new book, Assault & Flattery: The Truth About the Left and Their War on Women from Amazon today.